Price’s investigational and wildly innovative work has been screened at several museums across the United States and Europe, including the Museum of Modern Art, the San Francisco Cinematheque, and most recently the Whitney Museum. Known since the 1980s for his Super-8 films and performances, Luther Price has, in recent years, turned to 16mm film, creating new works from discarded prints of old documentaries, snippets of Hollywood features, and other examples of cinematic detritus. He re-edits the footage by hand, effaces the image through scraping, buries the films to rot and gather mold, and adds chaotic visual patterns using colored inks and permanent markers. For soundtracks, he frequently uses only the brutal electromechanical noise generated by sprocket holes running through the projector’s audio system. Each reel he produces is thereby a unique object, often altered to such an extent that it struggles through the projector, as if playing out the end of film itself; his is a cinema that ecstatically embraces its death drive, so as to achieve maximum potency. 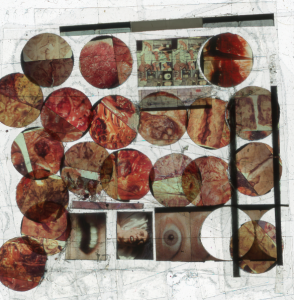 During Price’s screening at Counterpath, he will be showing the “Meat Slides” along with several 16mm films such as “Fancy” (2006), “The Biscuit Day” (2007), “Singing Biscuits” (2008), “Shelly Winters” (2010), among others. In this video, 2012 Whitney Biennial artist Luther Price discusses his handmade films and slides.